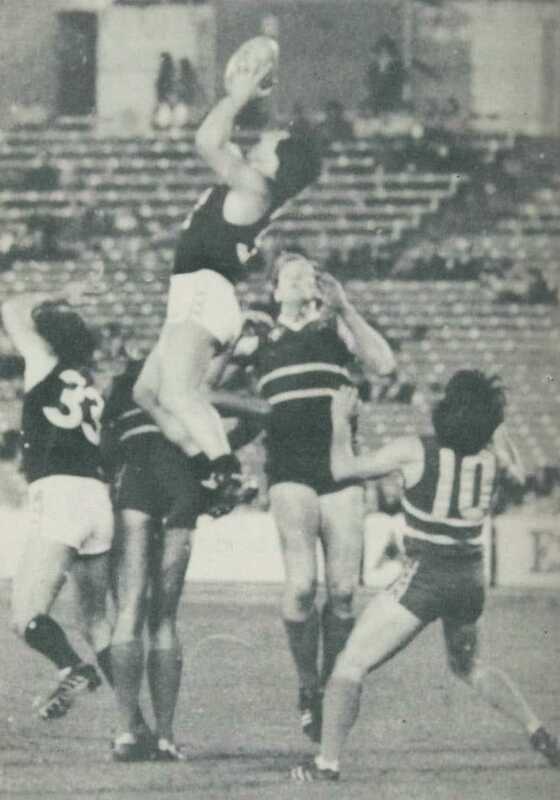 The 1981 AFC series was the second season of national football involving all the VFL, SANFL and WAFL clubs in the same competition, with lower ranked teams advancing through qualifying rounds and earning the right to face the top teams in the main draw. A total of thirty-four top level clubs from across Australia played 35 matches over five months, with the qualifying rounds held during the pre-season and the main draw held midweek throughout the premiership season. The 1981 competition was even more heavily-stacked in the VFL's favour with the VFL's top six teams entering directly into the main draw, whereas all 10 SANFL and 8 WAFL teams now had to advance through qualifying (in 1980 the top two clubs from SA and WA bypassed qualifying). This imbalance resulted in no SANFL or WAFL teams making it to the quarter finals for the first time in the AFC era. On May 5th the first double-header at VFL Park was played. The opening match was a qualifying play-off between Footscray and the A.C.T. and kicked-off at 6:30pm. This was followed by a Round 3 match between Hawthorn and East Fremantle at 8:30pm. The VFL later trialled the concept twice during the 1986 premiership season at the MCG (Rd.5 Melbourne-Sydney/North Melb.-Geelong and Rd.19 (Melbourne-Geelong/North Melb.-Footscray) and then at Waverley during the 1988 Night Series (Rd.1 Geelong-St Kilda/Hawthorn-Brisbane) before shelving the concept. 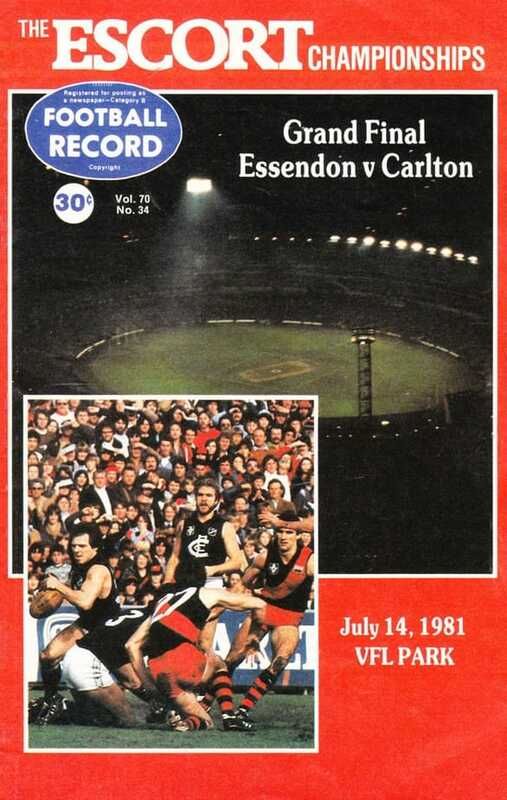 The 1981 series is best remembered for the "Baby Bombers", led by their rookie head coach Kevin Sheedy, overcoming a heavily-favoured Carlton side in the final. Trailing at halftime by 16 points, the Dons piled on 8.9 to 2.5 in the second half to steal the trophy from the Blues' grasp; Essendon's first senior silverware since their 1965 VFL premiership win. Tim Watson's epic leap over a pack followed by a running goal remains this author's fondest memory of the match. The competition again featured 34 teams (all 12 VFL clubs, all 10 SANFL clubs, all 8 WAFL clubs + Tasmania, Queensland, N.S.W. and the A.C.T.) but due to a change in the qualifying format, the number of matches increased from 33 to 35. As with the 1980 series, rounds 1 and 2 were qualifying rounds but in 1981 the format was modified so that each of the leagues and state teams split into their own groups for qualifying, competing against each other for the right to advance to the main draw (Round 3). This was intended to reduce travel and increase crowds for the early stages of the competition. A.C.T. d. Tasmania and advanced to a playoff against the VFL's losing team from Round 1 with the highest % (Footscray). The match was held at the end of qualifying and Footscray won, advancing to Round 3 and eliminating the A.C.T. from the competition. The competition became a straight-knockout format at this point and the match-ups were random (in qualifying match-ups had been based on each team's ranking). Teams 1-6 from the 1980 season (Richmond, Collingwood, Geelong, Carlton, North Melbourne, South Melbourne) joined the competition at this stage. They were joined by the four VFL teams that survived qualifying (Essendon, Hawthorn, Melbourne, Footscray). Eight of these 10 VFL teams advanced to the quarter finals. The three teams that advanced from qualifying (South Adelaide, Port Adelaide, West Adelaide) were all eliminated at this stage. The three teams that advanced from qualifying (East Perth, West Perth, East Fremantle) were all eliminated at this stage. Whilst the modified qualifying format had reduced the amount of travel for all teams, the fact that all SANFL and WAFL teams now entered at this stage, while VFL teams 1 to 6 still bypassed qualifying, again tipped the advantage too far in the VFL's favour. The direct result of this was no SANFL or WAFL teams in the quarter finals for the first time in the AFC Night Series era. *Luders and the Cowboy saddle-up - West Adelaide's Roger Luders and Kevin 'Cowboy' Neale, the former St Kilda champion, both had days out during the qualifying rounds. Luders kicked 8 goals versus Norwood followed by a 7-goal haul a week later against Central District. Neale then starred for the A.C.T., kicking 7 goals in their upset win over Tasmania. *Leading goalkicker of the series - not surprisingly, both players topped the goalkicking for the series; Luders led all scorers with 19 goals from 3 games, closely followed by Neale on 17 goals from 3 games. Carlton's Peter Bosustow (Carlton) was third with 11 goals from 4 games. *Big names make their debut - three VFL Premiership-winning coaches of the 1980s made their debuts in the 1981 Night Series. The opening round match between Essendon and Fitzroy marked the official start of Kevin Sheedy and Robert Walls' senior coaching careers. Sheedy remained in charge of the Bombers until 2007, leading them to flags in 1984-85, 1993 and 2000. Walls coached in all but one-season between 1981 and 1997, spending time at the helm of Fitzroy, Carlton, Brisbane and Richmond and leading Carlton to the 1987 premiership. Allan Jeans had previously coached St Kilda from 1961 to 1976, the highlight being the Saints' sole VFL premiership (in 1966). The opening round night match between Hawthorn and St Kilda was Jeans' return to coaching at the top level and signalled a return to glory for the Hawks, with Jeans leading them to premierships in 1983, 1986 and 1989. This match was also notable as the VFL-AFL debut of SANFL champion Rick Davies. *Collingwood massacre the Royals - the biggest blowout win of the 1981 series was Collingwood's 98-point thumping of East Perth. The Royals soon recovered, later playing finals and finishing 4th that season in the WAFL. *Fixturing fiasco - the quarter final between Collingwood and North Melbourne was originally scheduled for May 26 but was postponed due to torrential rain. June 9 was a vacant date in the Night Series fixture due to the Queen's Birthday split round (June 6/8) in the VFL competition. However, Collingwood were fixtured to play their split round match on the 8th so a night match on the 9th would result in them playing twice in two days. Richmond and Carlton were playing on the Saturday of the split round (the 6th) so their Night Series match was moved from the 16th to the 9th and the North Melbourne-Collingwood match was moved to the 16th, allowing all teams a three day break between matches. Such scheduling clashes caused by split rounds or Sunday games in the VFL fixture became an annual headache for AFC officials and ultimately led to the night competition moving to pre-season over the 1987-88 seasons. Listed below are match reports for all 35 games played during the series. This is the first time these reports have been collated and published online or in print. Kevin Sheedy and Robert Walls both made their senior coaching debut in this match. East Fremantle's big win gave them the highest % of all WAFL teams in Round 1 of qualifying and virtually assured them a spot in Round 3. First part of a double-header, this game started at 6:30pm. Second half of a double-header, this game started at 8:30pm. South Adelaide advanced directly to the main draw (Rd.3) as the winning SANFL team with the highest % from Round 1 of qualifying. Footscray's narrow loss allowed them to advance to Qualifying Rd.2 as the losing VFL team with the highest percentage after Rd.1.